This Order is issued by the Secretary of the Interior and the Secretary of Commerce (Secretaries) pursuant to the Endangered Species Act of 1973, 16 U.S.C. 1531, as amended (the Act), the federal-tribal trust relationship, and other federal law. Specifically, this Order clarifies the responsibilities of the component agencies, bureaus and offices of the Department of the Interior and the Department of Commerce (Departments), when actions taken under authority of the Act and associated implementing regulations affect, or may affect, Indian lands, tribal trust resources, or the exercise of American Indian tribal rights, as defined in this Order. 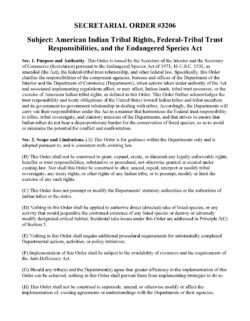 This Order further acknowledges the trust responsibility and treaty obligations of the United States toward Indian tribes and tribal members and its government-to-government relationship in dealing with tribes. Accordingly, the Departments will carry out their responsibilities under the Act in a manner that harmonizes the Federal trust responsibility to tribes, tribal sovereignty, and statutory missions of the Departments, and that strives to ensure that Indian tribes do not bear a disproportionate burden for the conservation of listed species, so as to avoid or minimize the potential for conflict and confrontation.